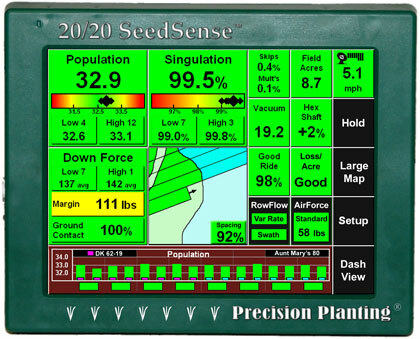 Yieldsense uses the 20/20 SeedSense monitor to deliver accurate and actionable yield data. With one simple and accurate calibration per crop type, yield data can be in your hands instantly on an iPad when combined with the FieldView Cab app. A flow sensor located in a proper location as well as unique designed paddles with a grain property bucket keep the system accurate without having to recalibrate for different conditions.